So without any further ado, here she is, Shannon Harper! 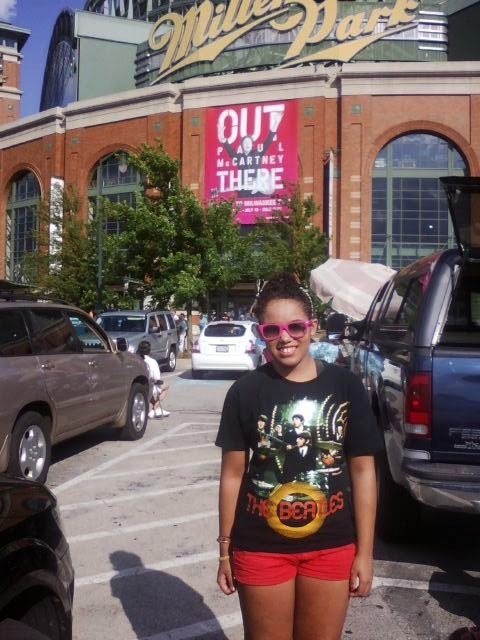 Shannon about to see Paul McCartney live in 2013. What is your earliest Beatles memory? Watching A Hard Day's Night with my family when I was about 7. I had huge crushes on George and Ringo after that. Did you ever attend a Beatles concert between 1960 and 1966? No; only in my dreams! Have you met any of the Beatles? Or anyone associated with  them? Have you ever seen John, Paul, George or Ringo on a solo tour/gig? Paul! July 16, 2013. :) Best night of my life. In what way have the Beatles inspired you? Did you take up a career because of them? Musical Theatre from this thought! We'd like to thank Shannon for taking the time to answer our questions!